Why do field hockey players get hurt? You might not realize it when you watch a game, but we run up to six miles during a game. We contort our bodies in some crazy ways, while holding sticks, to go for the ball. There's a lot of effort that goes into playing like a pro athlete! Let’s take a look at the three most common field hockey injuries. So, we’re not doctors or sports therapists, but as players we thought we’d demonstrate the injuries that are most common for the athletes who play field hockey. The ACL stands for the anterior cruciate ligament (and this will be on your quiz later, so listen up! 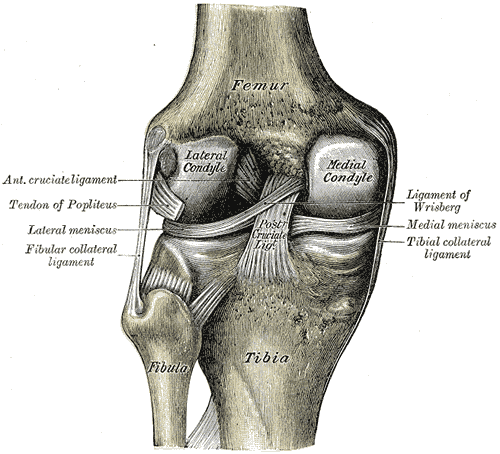 ), which is a ligament located in the knee. This ligament is located in the middle of the knee; it’s important because it connects the patella (knee cap) to the tibia (large bone in your leg). Tearing your ACL is becoming more and more prominent in females and even more so in field hockey. The reason for the increase in knee injuries to the ACL in field hockey is mainly due to the types of cuts we do as athletes, and also the types of fields we play on. When athletes are cutting on turf (fake grass) they are normally at a greater risk for tearing a ligament since the friction on turf has a lower coefficient than it does on grass. Turf shoes and cleats can cause the foot to get stuck in the turf, too, thus leading your knee to go in a different direction then your body. Ow! Most of you probably already know the answer to the next part, but yes, if you tear your ACL and want to continue to run and play a sport, then you will have to have surgery to repair the tear. The recovery process ranges from about 6-8 months, six months being a very speedy recovery. You will have to complete physical therapy to repair the knee back to full strength. It’s a very serious field hockey injury, but I know plenty of athletes who have bounced back from it. So not all is lost. Ankle sprains are common in most sports, but in field hockey they are more common than any other injury. And the culprit of this field hockey injury is exactly what you think it is: when you play on grass there can be a lot of holes on the field. The uneven surface makes it more likely athletes will trip. There are different severities of ankle sprains, from a week of recovery time, to several months, but I have learned through personal experience that ankles take awhile to recover. The ligaments around the ankle are easy to sprain, too. I have had countless teammates step on another teammates stick in practice, their ankle rolls over the stick and the ligaments become stretched out. This is what happens when you sprain an ankle; you are actually stretching those ligaments. When you have a fairly severe ankle sprain you can be out for a week to a month. If the ligaments are badly damaged then you could be out of the game for over a month. You’ll need to do a lot of rehab on that ankle. Rehab in this case means that you will have to strengthen your ligaments by doing different exercises with a physical therapist. You have to be careful with ankles since they tend to remain weak even after you heal well enough to play field hockey again. Since field hockey involves a lot of running and sprinting, it is inevitable that your hamstrings are going to be sore, and that probably once or twice in your career you are going to have a hamstring issue. Hamstrings are a very large muscle in the back of your leg and are used a great deal in sports that require a lot of running. The hamstrings are what make you move fast on the field, where the power to sprint is stored, but are also the muscles that take the most beating when you run a great deal. Hamstring issues arise when the muscles are being overused, but not strengthened enough when you are not playing. For example, on the National Team we do a lot of different hamstring exercises in the weight room to help strengthen these muscles. If our hamstrings are strong, then they are going to be able to help us more on the field. If you have access to a weight room, to prevent field hockey injuries, I would also suggest doing some strengthening exercises while you are in and out of season. This makes sure you are taking care of your different muscle groups and less likely to get injured. Finally, make sure you have the right field hockey equipment. The hockey stick you’re matched with, shin guards, mouth guard, and turf shoes all help you stay protected on the field.